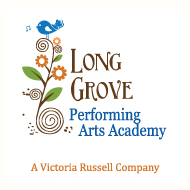 Long Grove Performing Arts Academy is dedicated to fostering artistic talent in a safe, supportive environment. Musical Theatre Troupe, Jr. and Sr. Acting Troupes, Baby Beautiful, Stories to Stage and more with an innovative curricula and uninhibited surroundings. We are also committed to providing performance opportunities to students who are ready to share their gifts and the skills they’ve learned. We perform during the year at all of the Long Grove festivals. We’ve also staged “Little Mermaid Jr”, “Jungle Book” and Annie Jr” and many more. We have performance recitals throughout the year for all of our students and parents. Families mean so much to us. Students will be challenged and encouraged, inspired and propelled. We believe in well rounded, inter-artistic learning that enriches, complements and enhances other interests. We can teach anyone from age Birth to Adult. We guide each and every student through the basics to advanced, in every performing arts discipline. We look forward to meeting you and your students today! Call us at 847-780-7464.